Explanation: Do you see it? This common question frequently precedes the rediscovery of one of the most commonly recognized configurations of stars on the northern sky: the Big Dipper. This grouping of stars is one of the few things that has likely been seen, and will be seen, by every generation. The Big Dipper is not by itself a constellation. Although part of the constellation of the Great Bear (Ursa Major), the Big Dipper is an asterism that has been known by different names to different societies. Five of the Big Dipper stars are actually near each other in space and were likely formed at nearly the same time. Connecting two stars in the far part of the Big Dipper will lead one to Polaris, the North Star, which is part of the Little Dipper. Relative stellar motions will cause the Big Dipper to slowly change its configuration over the next 100,000 years. 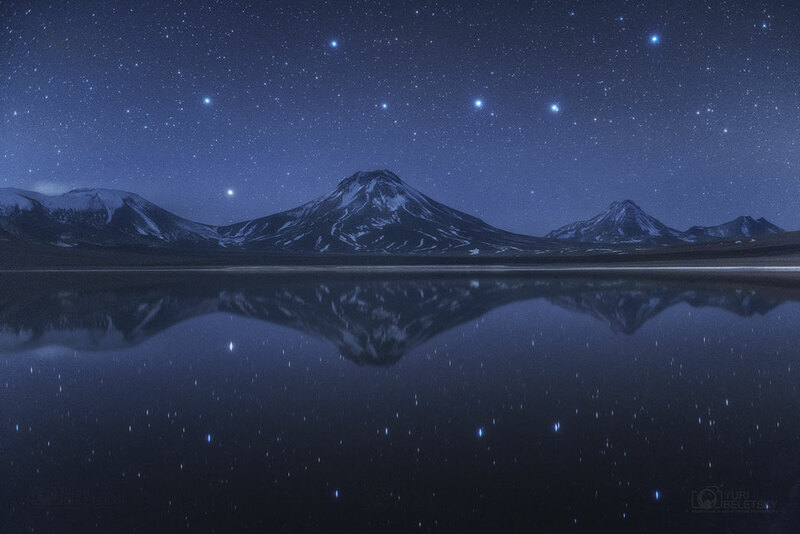 Pictured in late April, the Big Dipper was actually imaged twice -- above and below distant Chilean volcanoes, the later reflected from an unusually calm lagoon.